Towards 2020 MSPO target | Daily Express Online, Sabah, Malaysia. Kota Kinabalu: Primary Industries Minister, Teresa Kok, hopes to see all oil palm estates including those owned by smallholders in the country to be Malaysian Sustainable Palm Oil (MSPO) certified by January, 2020. She said up until July this year only 5.21 per cent or 118,063.08 hectares out of the total 2,267,716ha oil palm cultivated areas by smallholders throughout the country has been MSPO-certified. This includes the 105,751.06ha under 56 clustered smallholders schemes under the government agencies like Felda, Felcra, Salcra, SLDB and so on, and the 12,312.02ha under 62 clustered private smallholders schemes or Sustainable Palm Oil Clusters (SPOCs) under the Malaysian Palm Oil Board (MPOB). 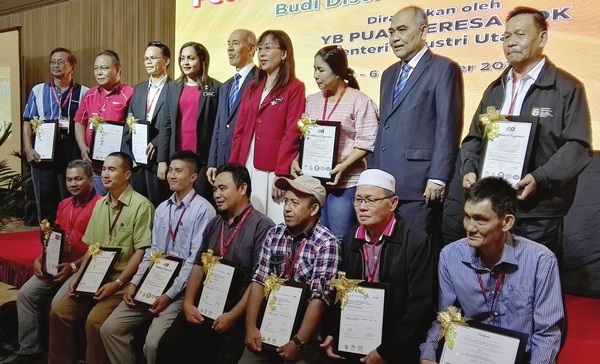 "In Sabah, the MSPO certification achievement is less encouraging because only 1.2 per cent or 2,613.25ha out of the total 221,148.49ha oil palm cultivated land by smallholders has been MSPO certified up until July this year," she said when officiating at the National Oil Palm Smallholders Conference 2018 held at the Promenade Hotel here on Thursday. MPOB Chairman Tan Sri Mohd Bakke Salleh and Director-General Datuk Dr Ahmad Kushairi Din, among others, were also present. Kok said the MSPO certification's implementation cost for private smallholders are fully borne by the Government through an RM135 per hectare incentive, while urging those have yet been certified to seek advice from the nearest MPOB office or any agencies like Felda, Felcra, SLDB and others. "MSPO certification can strength market guarantee at the international level, open more new markets and rebrand Malaysian palm oil as a premium and sustainable palm oil. The involvement and support of all those involved in the oil palm industry of all levels are vital for the success of this scheme," he said. MSPO is an important strategy for boosting the image of Malaysian oil palm industry at the international level as well as the competitiveness of palm oil from this country, said Kok, while calling for the involvement and commitment of all parties concerned to be together in the transformation process by optimising the use of technologies and expanding the applications of good agricultural practices in developing sustainable oil palm cultivation. To date there are nearly 650,000 smallholders operating privately or under schemes by various Federal and State agencies, covering nearly 40 per cent of the total oil palm cultivated land in the country. Kok said the Government wants the oil palm industry to continuously contributing positively to the country's economic progress, particularly in providing various job opportunities and uplifting the socioeconomic status of the rural folks. "The welfare of smallholders are given main focus and we want to uplift the role of smallholders especially in increasing oil palm production in sustainable manner and their involvement in the downstream sector," she said. Meanwhile, Kok said surplus in stock is the main factor behind the current dwindling price of crude palm oil. The price of palm oil from January to June this year was at RM2,420.50 per tonne, compared to RM2,944.50 per tonne in the same year last year, she said, adding that as of Thursday, the price has continue dropping by about RM200. She said the Government has taken proactive measures to strengthen and stabilise the price as well as increase the competitiveness of the country's oil palm industry. Among them, she said, by optimising the use of domestic oil palm products like in the implementation of B7 Biodiesel Programme, which will be upgraded to B10, and by strengthening the current marketplace for the country's palm oil as well as exploring new markets like Africa and Philippines. Kok also presented awards to newly MSPO-certified and successful smallholders throughout the country during the event.